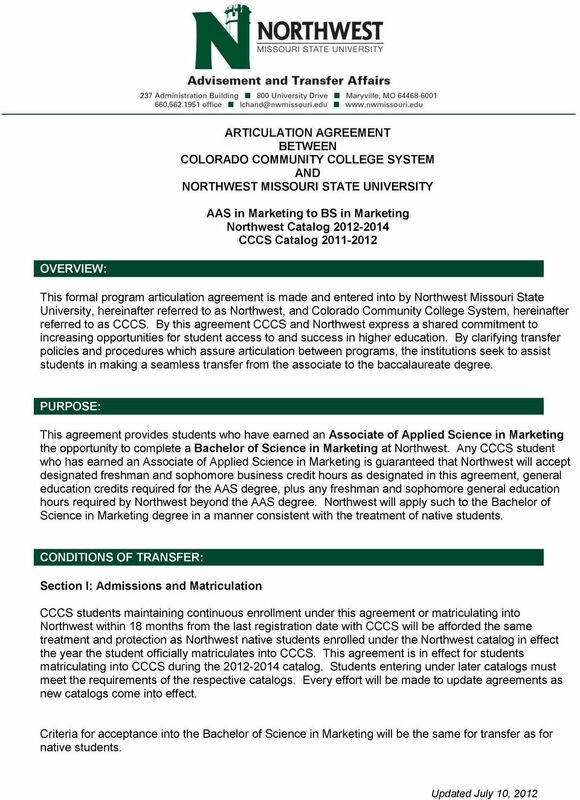 Download "ARTICULATION AGREEMENT BETWEEN COLORADO COMMUNITY COLLEGE SYSTEM AND NORTHWEST MISSOURI STATE UNIVERSITY"
1 ARTICULATION AGREEMENT BETWEEN COLORADO COMMUNITY COLLEGE SYSTEM AND NORTHWEST MISSOURI STATE UNIVERSITY AAS in Marketing to BS in Marketing Northwest Catalog CCCS Catalog OVERVIEW: This formal program articulation agreement is made and entered into by Northwest Missouri State University, hereinafter referred to as Northwest, and Colorado Community College System, hereinafter referred to as CCCS. By this agreement CCCS and Northwest express a shared commitment to increasing opportunities for student access to and success in higher education. By clarifying transfer policies and procedures which assure articulation between programs, the institutions seek to assist students in making a seamless transfer from the associate to the baccalaureate degree. 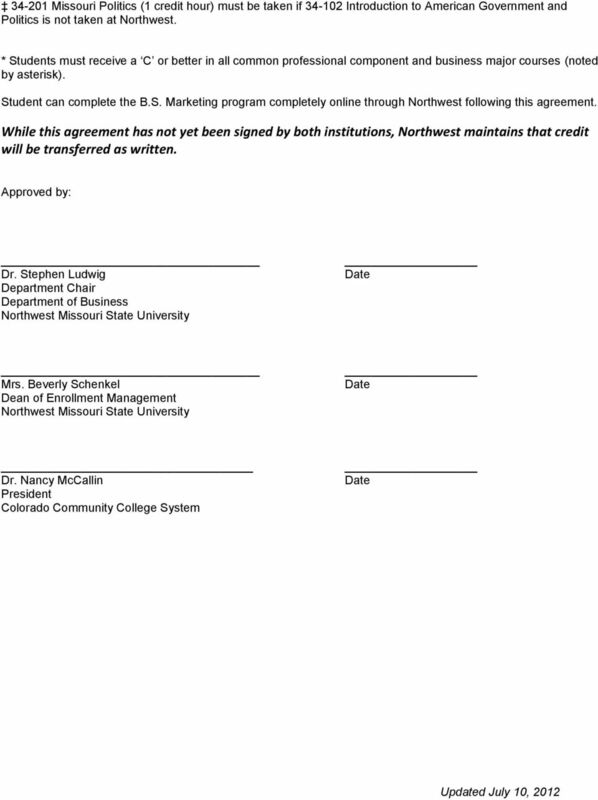 PURPOSE: This agreement provides students who have earned an Associate of Applied Science in Marketing the opportunity to complete a Bachelor of Science in Marketing at Northwest. 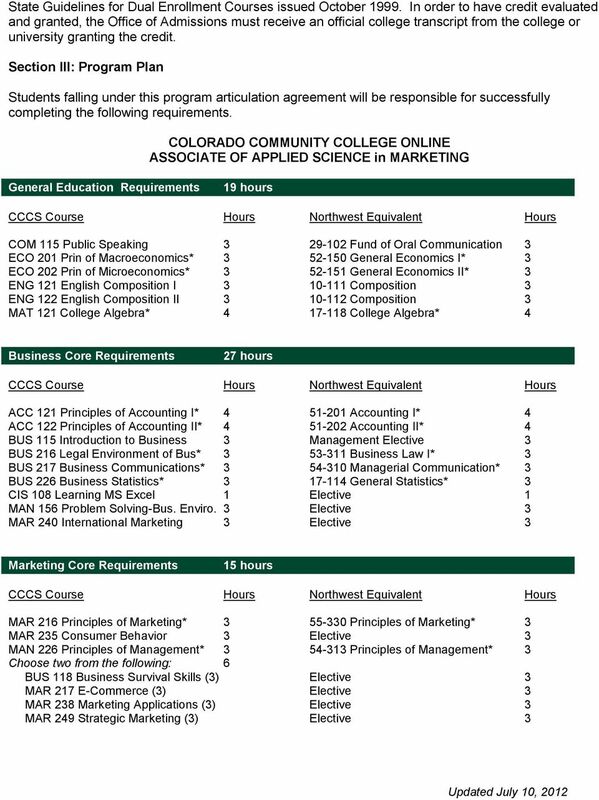 Any CCCS student who has earned an Associate of Applied Science in Marketing is guaranteed that Northwest will accept designated freshman and sophomore business credit hours as designated in this agreement, general education credits required for the AAS degree, plus any freshman and sophomore general education hours required by Northwest beyond the AAS degree. Northwest will apply such to the Bachelor of Science in Marketing degree in a manner consistent with the treatment of native students. 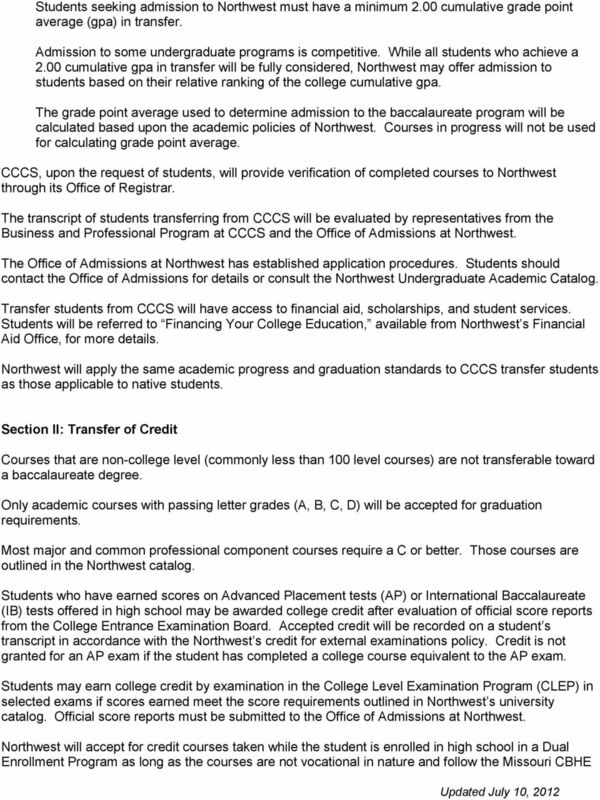 CONDITIONS OF TRANSFER: Section I: Admissions and Matriculation CCCS students maintaining continuous enrollment under this agreement or matriculating into Northwest within 18 months from the last registration date with CCCS will be afforded the same treatment and protection as Northwest native students enrolled under the Northwest catalog in effect the year the student officially matriculates into CCCS. This agreement is in effect for students matriculating into CCCS during the catalog. Students entering under later catalogs must meet the requirements of the respective catalogs. Every effort will be made to update agreements as new catalogs come into effect. Criteria for acceptance into the Bachelor of Science in Marketing will be the same for transfer as for native students. 4 The following courses (36-37 hours) may be taken at either CCCS or Northwest. Northwest Course POS 111 American Government OR POS 105 Intro to Political Science 3 HIS 201 U.S. History I OR HIS 202 U.S. History II 3 BIO 105 Science of Biology 5 Physical Sci Requirement (choose one) 4-5 AST 101, 102, CHE 111, GEY 111, PHY 111 LIT 115 Introduction to Literature 3 HUM 121 Intro to Humanities I OR 3 HUM 122 Intro to Humanities II 3 ART 110 Art Appreciation OR 3 MUS 120 Music Appreciation PSY 101 General Psychology I 3 CIS 118 Intro to Microcomputer Apps* 3 Multicultural Requirement (choose one): 3 ASL 121, ANT 101, 221, 260, ARA 101, 111, CHI 101, 111, COM 220, EDU 234, ETH 200, 212, 224, FRE 101, 111, GER 101, 111, HEB 111, HUM 241, ITA 101, 111, JPN 101, 111, LIT 205, MED 104, MUS 123, PHI 115, 116, RUS 101, 111, SOC 208, SPA 101, 111, 114, WST Intro to Am. Gov & Politics 3 Government Equivalent 3 History Equivalent 3 History Equivalent /103 General Biology & Lab 4 Physical Science Requirement Introduction to Literature Western Civilization I 3 Humanities/Philosophy Equivalent Art Appreciation 3 Fine Arts Equivalent General Psychology Computers & Info Technology* 3 Multicultural/Diversity Requirement 3 The following courses (40 hours) must be completed at Northwest Missouri Politics Fundamentals of Business Finance* Operations Management* Organizational Policy & Decision Making* International Business* Management Information Systems* Promotion* Consumer Behavior* Sales & Sales Management* Marketing Research* Marketing Management* 3 Students must take two of the following: Intern in Management* (3) or Intern in Marketing* (3) Retailing* (3) Logistics Management* (3) Business Study Abroad* (3) Recommended Electives*: or 400-level advisor-approved elective Total hours from both institutions required for B.S. in Marketing 124 Electives must be taken to total 124 credit hours. 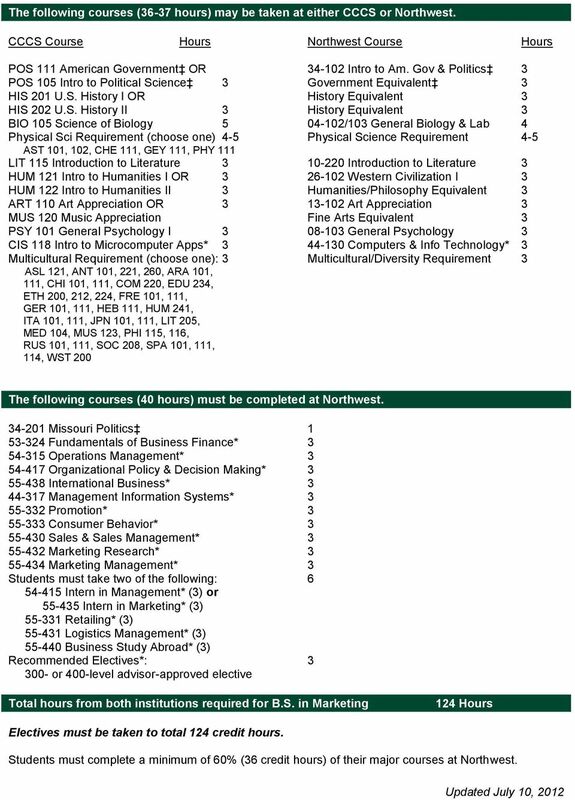 Students must complete a minimum of 60% (36 credit hours) of their major courses at Northwest. NCMC, upon the request of students, will provide verification of completed courses to Northwest through its Office of Registrar. Degree Programs -69- Degree Programs -70- Otero Junior College DEGREE PROGRAMS Guidelines A student s career and technical education objective and academic educational objectives require careful planning. EFFECTIVE DATE AND PROVISION FOR CANCELLATION This agreement goes into effect when signed by all individuals listed below. Transfer students from MAC will have access to financial aid and student services on the same basis as native students. have not earned the A.S. degree choose one of the English courses listed in Appendix B to fulfill the CLAR 209 requirement. 2013-15 UW Colleges Transfer Guide Psychology Bachelor of Arts (BA) College of Letters & Science The following guide is intended to assist you in planning for your eventual transfer to and graduation from.